Picture this… you are a co-ed, coming home to NYC to visit your family, the Bushwick section of Brooklyn to be specific. You get off the subway and there is no one anywhere. Moments later, as you walk up up the steps, you suddenly realize that something crazy is going on, as gun fire and explosions break way to deafening silence which breaks way to more gun fire and explosions. The conceit of this film is stellar. Separatist militia armies from Texas choose NYC as a strategic base to center their coup d’etat. With racist rationale that blacks and latinos are too lazy to fight back, the leaders of these militias believed the Bushwick section of Brooklyn to be the perfect place to hit the ground and seize. Suffice it today, there was far more resistance than they believed. What was built off of this conceit is a mixed bag. There are moments of brilliant action, pure emotive acting, and innovative use of the concepts. There are also points where the possibilities feel wasted and so much more could have been done. There aren’t necessarily moments to point to as being things that “don’t work” but there are points where stronger writing could have built this good film into great film. Nonetheless, the strong conceit that invokes the current national climate takes this film a long way. Dave Bautista shows heart and soul in his role. As a former military medic who lost his family in 9/11, he has so much nuance in his portrayal. He’s truly coming into his own as an action star who can legitimately act and this role is another great example. Brittany Snow and Angelic Zambrana are the other two main characters in this film. Both handle their roles well, as do the supporting players. Snow and Bautsta do the most heavy lifting, though Zambrana’s character’s importance intensifies as the film progresses. She is vital to the ending of the film and her portrayal of her role is strong in encapsulating the emotion of what is going on. The film isn’t afraid to go dark and isn’t afraid to shock. In the opening minutes this should become apparent, yet several moments that occur later in the film go beyond common expectation. Characters aren’t safe just because we grow attached to them; this mirroring of real life helps to make this film feel plausible. Real life is dark and unpredictable. 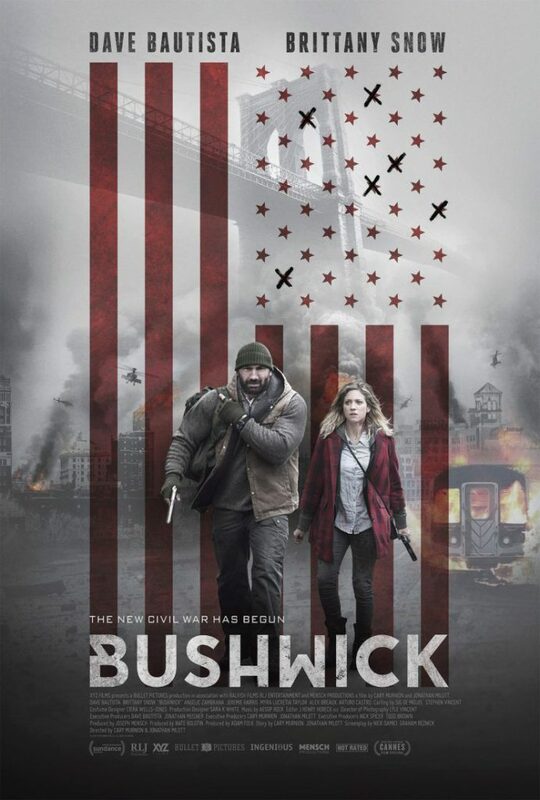 Releasing to home video today from RLJ Entertainment (who has been distributing and promoting a lot of strong low to mid budget fare as of late, such as the much lauded Brawl on Cell Block 99), Bushwick is available to own on DVD, Blu-ray, and via most VOD outlets. Grab a copy if you think a new civil war may be coming… or if you just want a solid action flick to watch once the kids head to bed tonight.